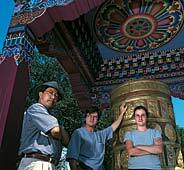 John Simpson 89 had been building Kathmandu in his head for years. Ever since 1994, when the young painter first read The 100,000 Songs of Milarepa during his early Buddhist inquiries, hed been envisioning the vibrant forms and colors of Tibetan temples, mandalas, deities, and shrines. At the time, Simpsons main focus outside his own studio was building exhibition settings at the Springfield Museums. In 1997, he added to that management of the Hampden Gallery in the Southwest Residential Area on campus. In 1996, he began work on three elaborate rooms, each enshrining a life-size Tibetan deity rendered in wood, wire mesh, and claycrete, a glue-and-paper compound. Four years later, this work has appeared not only on campus and in Springfield, but on the National Mall in Washington. Its brought Simpson contact with mandala-making monks and the friendship of one of Tibets most revered artists. Its even brought a near view of His Holiness, the Dalai Lama. At UMass, using the Hampden crafts room as workspace, Simpson and his growing crew of students and local artists worked first on the Green Tara shrine. A female deity and distinctly beautiful despite her greenish hue, Tara is the goddess of jealousy turned to altruistic wisdom. They turned next to the Black Mahakala, a portly, six-armed god of anger with bugged-out eyes and a ferocious entourage of skulls and skins. Work was still proceeding on the Tara shrine when Simpsons Springfield Museums colleagues, including his wife, director of museum education Kay Simpson 99G, invited him to install Kathmandu as part of Art From the Roof of the World. In this series of exhibitions scheduled to open at the G.W.V. Smith Art Museum in February 2000, the temple rooms would join artwork from the personal collection of the Dalai Lama and from the Drepung Loseling Monastery in Atlanta, plus a sand mandala to be created on-site by Drepung monks. As he had for previous projects in Springfield, Simpson enlisted the aid of David Browns carpentry class at Putnam Vocational High School. Using Simpsons drawings to craft columns and pedestals, prayer wheels and mandalas, became an interdisciplinary study in construction and culture for those students. As the UMass crew began work on a 10-foot-high statue of the Buddha  greatest and most powerful of Tibetan religious figures  Simpson received a visit from Kelsang Lodoe Oshoe of India, one of the Dalai Lamas personal painters. Oshoe was teaching at the Namgyal Monastery in upstate New York, and had heard from an acquaintance of Simpsons ambitious undertaking. After seeing the Black Mahakala room, Oshoe told Simpson, its walls came alive in his dreams, its skeletons and skins swirling in his mind. He returned day after day  eventually moving to the Valley for a year to work on the Buddha and serve as teacher and spiritual guide to the projects volunteer crew at UMass. During that time he stayed with the Simpsons in their Holyoke home. More good karma was in store. While Kathmandu was on display in Springfield, Simpson heard that a Buddha shrine was needed for Tibetan Culture: Beyond the Land of Snows, an exhibition scheduled to open on the National Mall in Washington in June 2000 as part of the annual Smithsonian Institution folklife festival. Also needed was a Tibetan gate to serve as an entryway to the festival. When Simpson offered the shrine, he was asked build the gate as well. Now, just a few months before the festival, he and Oshoe reorganized the work crew, called the Putnam School for more help, and began construction on the 18-foot-high wooden gate. Kendra Denny 01, one of the original crew who built Kathmandu at UMass, was also part of the team that traveled to Washington for two weeks to install and maintain the shrine on the Mall. She says it was a never-ending process. The crew usually arrived early in the morning, worked until the festival opened, then took part in the days activities  or just rested. It was hard work but I dont think any of us felt too stressed out, at least in a bad way, she says now. Simpson agrees that the workload was heavy, but also that it was offset by an atmosphere of cultural and religious energy. He remembers resting under a shade tree, tired and sore from weeks of sawing and gluing, hammering and painting, and drifting off to sleep to the sound of a nun singing Om mani padme hum, the mantra of the bodhisattva of compassion. During the festival, Simpsons Buddha served as a backdrop for monastic teachings, and its shrine housed a beautiful copper prayer wheel brought from India. Over 1.5 million people passed under the festival gate, including the Dalai Lama himself. Simpson had an opportunity to meet His Holiness but, nervous, stood back to take photographs instead. Though Kathmandu has now been dismantled, parts of the installation live on across the country. 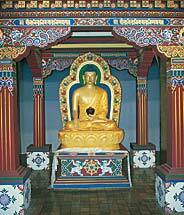 The Buddha has been enshrined at a retreat in Pennsylvania. 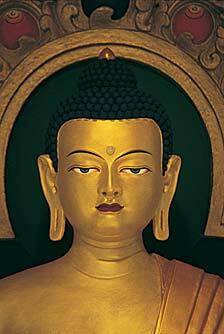 The Green Tara is at a meditation center in Northampton. The festival gate, purchased from the Smithsonian by a California businessman, will be permanently installed in Golden Gate Park in San Francisco. And the project goes on. Kendra Denny plans stay in the valley after completing her degree this spring to work with Simpson and Oshoe on the next temple, which will celebrate the Buddha-like religious figure Padma Sambhava.